An estimated 750,000 people watched as a horse-dragon took back its wings from a giant spider in downtown Ottawa over four days. 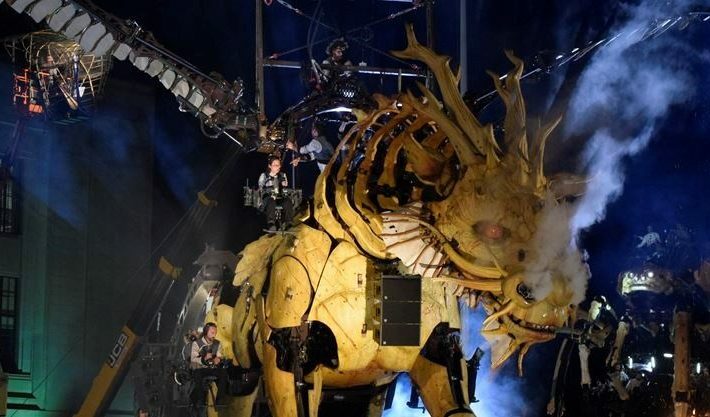 According to Ottawa 2017 organizers, the French street theatre production company La Machine made the event the city’s biggest theatrical production ever. The crowd estimate surpassed numbers thought to have attended Canada Day this year. Heritage Canada estimated at least 100,000 people were on Parliament Hill and between 450,000 and 500,000 people were in the downtown core for the sesquicentennial. Guy Laflamme, executive director of Ottawa 2017, said his initial estimate for the event was that it would draw about 300,000 people. With some additional video screens, security and other extras, the event cost slightly more than the $3.5 million set aside for it, but that’s covered in the contingency fund, Laflamme said. “It’s probably the best investment we could have dreamed of,” he said. An additional 30 to 40 volunteers had to be added to handle the crowds.